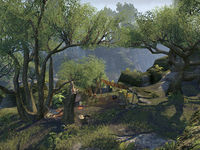 Seaside Overlook is a cliff overlooking the Seaside Sanctuary to the south, in western Greenshade. A camp, which is occupied by Veiled Heritance members and skeletons, is set up at the cliff's edge. Greenshade Pathfinder 5 Discover all of the striking locales in Greenshade. This page was last modified on 20 February 2019, at 11:43.